Jacksonville’s Crowley Maritime recently christened its newest Made in America vessel, the El Coquí, at the Jacksonville Port Authority Cruise Terminal. 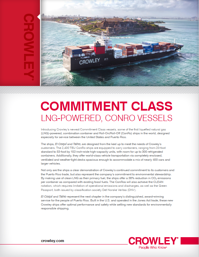 This ship is the first of two cutting edge “Commitment Class” ships slated for Crowley’s shipping and logistics services between Jacksonville and Puerto Rico. It is also a shining symbol of the United States maritime industry’s future potential and its importance. According to the Department of Transportation, there is a shortfall of over 1,800 mariners to meet military wartime requirements; every new ship like the El Coquí means more trained mariners to support the United States military in a crisis. The same merchant mariners who operate ships like El Coquí and move people and materiel across the oceans also carry the cargoes that are the lifeblood of international trade. It’s no coincidence that since President Donald Trump took office, the number of workers employed in the United States maritime industry has expanded by over 6 percent. There are also two key Buy American, Hire American policies giving added lift to our merchant marine. The Jones Act requires that a ship like the El Coquí, which moves between two United States ports, be built in the United States and owned and crewed by Americans. The Cargo Preference program requires that a percentage of United States Government-funded cargoes, like food aid, be carried on United States-flagged ships. As the El Coquí officially enters Crowley’s fleet, it signals another important step in the continued revival of an American industry. Peter Navarro is director of the White House Office of Trade and Manufacturing Policy.